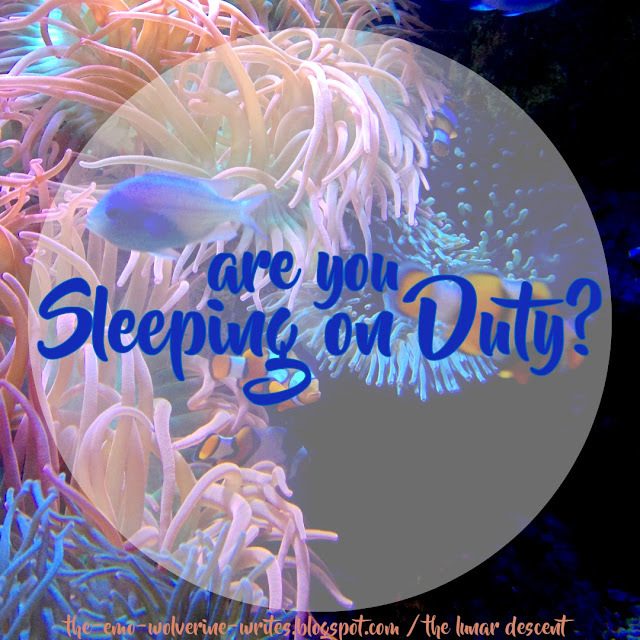 Are You Asleep On Duty? I’m pretty sure everybody has had their ’emo’ teenage phases, whether it was obsessing over aesthetics or people or ideas. I’m not sure if you could accurately summarize your phase though- there are just so many aspects to take into account that you can’t really summarize it, just like how you can’t summarize a person. Maybe your teenage phase consisted of trading Pokemon cards or playing the game, or pretending the world was a simulation, or imagining yourself on an adventure. I was the kind of kid who liked building an imaginary world, augmented by ideas and concepts I hoarded almost jealously from my favorite tv shows and books. It would be a lie if I said that I didn’t obsess over fictional characters. It would also be a lie if I said that those characters didn’t shape me. I am not lying when I say that it was all very childish and embarrassing, now that I think about it, but considering how I was 15, 16, just in the middle of the teenage timeline, I’m not very surprised. If, out of that tangled mess, I had to pick one thing that I could state without embarrassing myself, it would be this one quote that the 15 year old me would be busy scrawling everywhere. I didn’t know where this came from. I didn’t care who said it. All I knew was that it sounded nice and it fit in with my fictional world and nestled against concepts like crusading against all the obstacles thrown in my way. You see, back when I was 15, the idea of watching and rebelling- or at least, fighting injustice, was a pretty romantic concept. Maybe it was because those young teenage years are when you’re so full of ideas and you feel like such an adult, you’re busy trying to find ways to express yourself. Five years later, and I’m still finding myself head over heels for rebelling- protesting, fighting. The concept hasn’t lost any of it’s enticing visions of bravery, courageousness and righteousness. Send me to a protest, hand me a sign, and I’ll stand there for something I believe in. I thought this was something normal. That everyone felt the same way and that if you walked up to the average person and handed them a sign, they’re stand for your cause too. Things don’t work that way, unfortunately. I’ll tell you how I found out. If you thought that the most oppressed Muslims in the world are American Muslims thanks to Trump and hate speech, or maybe Saudi women because they can’t drive, I’m gonna have to break your little bubble. The world does not draw a line between “first” world and “third” world- these are arbitrary terms that we, ourselves, have invented, whether it comes to quality of life, level of education, media representation etc. Why am I calling this arbitrary? Because 200 years ago, the world was different and 200 years from now, it will be different. Empires rise and empires fall. Terms like first world and second world will shuffle around- these are not characteristics of a country, these are simply titles that can be claimed and lost. You know what will never change, no matter what century you’re in? The fact that humans can be cruel and oppressive to each other as they consider lives as collateral damage- whether it’s colonization, genocide or war. These are not historical terms. These are terms that are very much contemporary- they are happening now. I give you three examples; Syria, Kashmir, Palestine and Burma. I would explain these situations out for you, but I feel like I’ve been writing really scattered ideas already, so I’m just going to try wrapping up and getting to the point. I’d like to clarify that there are a lot of other example to pick from, and just because I picked these issues, doesn’t mean that there aren’t other issues that aren’t as important. All kinds of injustice and loss of human life is wrong and important and needs to be addressed. You might be getting the point I’m trying to make here. While you are a citizen of the world community, your job is to watch out for any sort of injustice going on in your area, country, continent, planet. If you sit by and let things like this happen, you have failed your duty as a citizen. 1) Be aware. Be involved in the issues around you, whether it’s something happening in your neighborhood or something on tv or something that popped up on your newsfeed. Don’t be willfully ignorant! 2) Join protests. For real, get up and make yourself physically present to demonstrate how much you don’t support what’s happening. Even if the protest doesn’t change anything, go. Put your weight in. Sometimes, one person is all it takes to tip the balance. 3) Tell others. Spread the news, get people involved. If you can’t go to protests, make it your job to at least send one person in your place. Share, share consistently, whether it’s a post on Facebook or a word of mouth discussion. 4) Write letters. Or emails. Whichever. Write to your embassy or to the UN or your local politician or representative. Write to them and tell them what you want done. They’re meant to represent you and you need to do your part in letting them know that you’re not happy with what’s going on! 5) If you can’t do any of the above things at all, pray. If you won’t do these things for the people suffering in the world, at least do this for yourself. Don’t become a part of the bystander crowd who sit and watch while the world burns. Remember, sooner or later, your house might be on fire too. What goes around will inevitably come back around. Posted in GeneralcommentLeave a Comment on Are You Asleep On Duty?